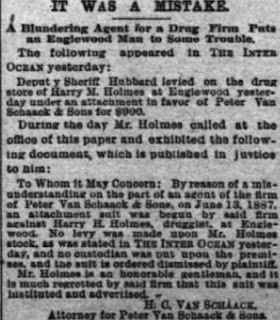 In June, 1887, among the Inter Ocean‘s legal notices was small note: “Deputy Sherriff Hubbard levied on the drug store of Harry H. Holmes at Englewood yesterday under an attachment in favor for Peter Van Schaack & Sons for $900.” H.H. Holmes would have been running the pharmacy he’d bought from Dr. Elizabeth Holton at the time; construction on his famous “castle” across the street would begin the next month. Van Schaack was a wholesale druggist, one of a few who supplied him. Apparently, Holmes had not paid his bill. As usual. There was, in fact, a lawsuit between Holmes and Van Schaack and Sons. 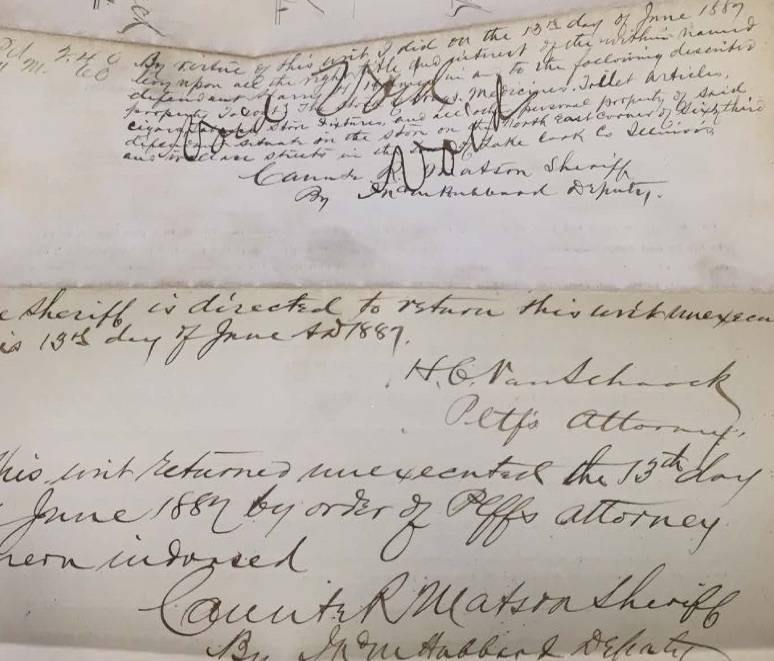 A court summons had been sworn out and notarized on June 13th for Holmes to appear in court to answer charges on July 18th. But Holmes apparently talked his way out of it; the word “void” is written all over the paperwork. It’s fairly easy to imagine what happened. 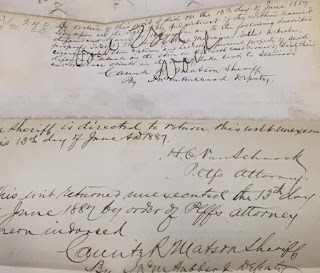 Holmes was served with the lawsuit for non-payment, and marched into Van Schaack’s office, saying something like “I totally sent the check – it must have just fallen through the cracks or got lost in the mail. How dare you drag my name through the mud over a simple clerical error! This could damage my reputation!” He not only persuaded them to drop the suit, but got them to write a letter apologizing and calling him an honorable gentleman! This is one of very few pieces of data about Holmes’s conduct when he was working in the drug store he ran before building the castle. There are several references to Dr. Holton having trouble getting Holmes to make the payments he promised for buying the pharmacy, but if that were the case, they seem to have settled up in the end without going to court (and without Holmes killing the Holtons, as he is often said to have done). Perhaps the same thing happened with Van Schaack and Sons. From what we can see on record, Holmes was pretty bad about paying his debts, but in those days he usually either eventually got around to it or managed to drag things out indefinitely. Lawsuits against him don’t really begin in earnest until about 1890.